“I guess the most traumatic times for me as a reporter were the fires which destroyed or badly damaged so many of the familiar landmarks which were a part of my memories. Watching Woolworth’s burn, and Davis School, and the Paramount Theatre (which was all over when I knew about it) and the old building on Howard Street across from Deposit Guaranty Bank [more recently Planter’s Bank, corner of Howard and Market], brought tears to my eyes. “It was early one morning when I stood across the street and watched Barrett’s Drug Store burning. 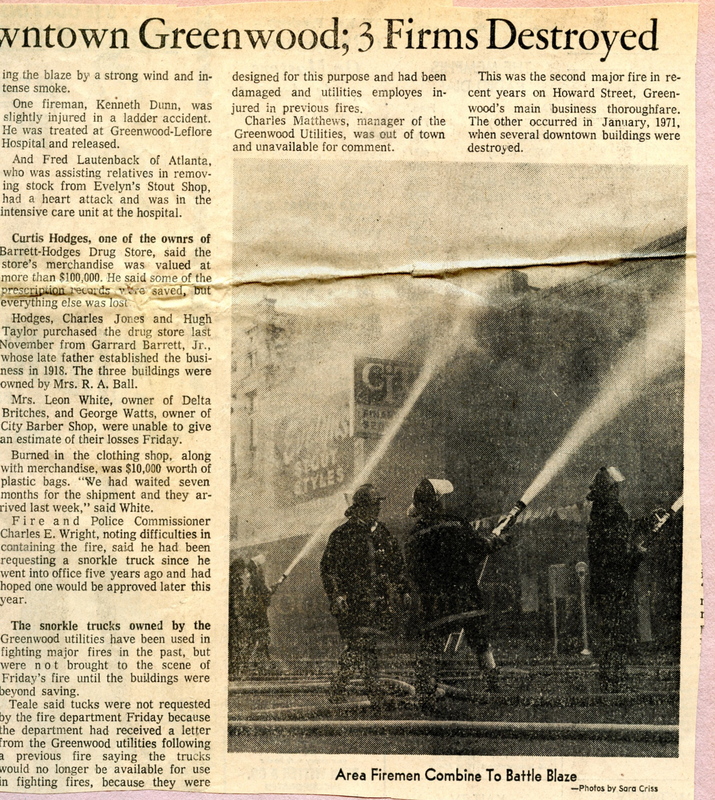 It had caught fire from the building next door which houses ‘Evelyn’s Britches.’ I could remember it as it was when I was a little girl (it was much smaller then) and remembered the many times I had stood at the front of the store and sipped a Coke while talking to Garrard Barrett and Pat Hemphill and Mr. Burks. Daddy bought us candy there and we walked up there after movies at the Paramount. The nature of Sara’s job found us often at the scene of fires and we shared a deep love and appreciation for old buildings, which made it that much harder to see them go down in ashes. 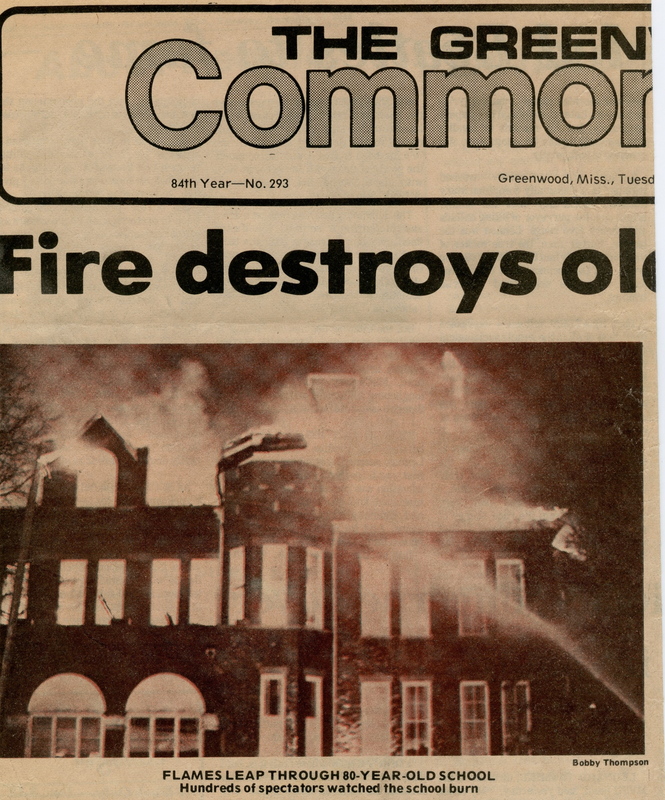 I’m glad I wasn’t in town when Davis School and Barrett’s and Woolworth burned, as there are some things you just don’t want to see. I was around on that very cold winter night when the pool hall on Market Street caught fire, sending the flames into Staplcotn’s warehouse in the middle of a heavy snow shower. Sara and I stood in front of Gray Evans’ law office and watched those blazing cotton samples explode out of the warehouse and land on neighboring roofs along Howard Street. The fire chief told Sara that if there hadn’t been heavy snow on the roofs, they could have lost whole blocks of Howard Street. That’s just too close for comfort.